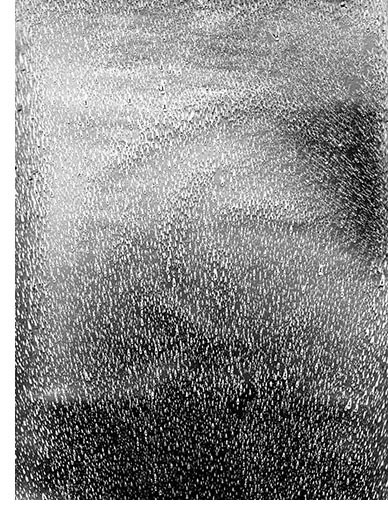 Klea McKenna Rainstorm #11 (Kona, April), 2014, unique gelatin silver photogram of rain, 41 1/2 x 33 1/2". Courtesy of artist and Von Lintel Gallery. The title of the show is derived from the traditional Jewish idea that a new day begins not at dawn but at sundown. Using this notion as a jumping-off point of sorts, the curators take us through a rethinking of various received notions about time and space—asking us to grapple with the infinity of both, as well as how, in modern life, we struggle to reconcile both our psychology and our spirituality to various inconceivable immensities, ranging from the size of the universe to global warming and its consequences. Contemporary art has had on-again, off-again love affairs with science and mathematics, borrowing and adapting attractive bits. Dorothea Rockburne and Mel Bochner come to mind, as do Light and Space artists like James Turrell or Robert Irwin. This exhibition, however, is much closer in spirit to artist’s museums or curatorial interventions– in particular, to David Wilson’s Museum of Jurassic Technology in Los Angeles. Night Begins the Day’s combination of the real and the fantastic, the extraordinary and the exquisitely meditative, invokes an experience not dissimilar to that generated by the MJT’s darkened spaces. One of the first things encountered here, for example, is a giant clock gear from a full-scale prototype of the Long Now Foundation’s 10,000-Year Clock, a device that is now nearing completion in a secret location in West Texas. The idea of a real clock that keeps time for a thousand centuries is a good place to begin stretching our imaginative capacities. Other works abound, such as Fred Tomaselli’s painted photograms of flowers or leaves in which radiating bright gouache lines seemingly elaborate the inner aura of the vegetation. Then there are Katie Paterson’s letters of condolence for stars that have died. Following the title’s theme, a number of pieces take the distant mysteries of the night sky as their subject. In a small, extra-dark room, looped video by Lisa K. Blatt shows the Milky Way reflected in the rippling surface of the world’s clearest lake, buried deep in the mountains of Patagonia, far from light pollution. I looked for a long time but was able to see only an unending twinkle on wind-ruffled water, the broken bits of swimming light making a living photograph. 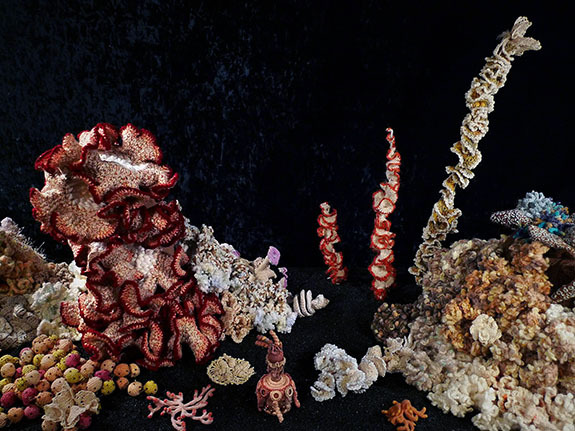 Institute For Figuring, Bleached Reef, 2007–15. Yarns, beads, baskets, felt, sand, 84 x 24". Courtesy of Bleached Reef, part of the Institute For Figuring’s Crochet Coral Reef Project. Nearby, Vanessa Marsh’s astonishing photograms show galaxies and auroras of gorgeous swirling stars over a horizon of mountains, all of which is completely made up, -fabricated by hand, rather than recorded by a camera’s lens. Similarly, in Robert Kooima’s Total Perspective Vortex, a joystick-operated rendering of a database of 2,533,774 stars in real time, viewers find themselves teetering on the edge between the conceptual and the actual. We are so inured by science fiction to the image of stars rushing by us that zipping around the sky feels familiar, if slightly vertiginous. Other works seem attractive but so tortuously complicated in their conception that their impact is muffled, such as Josiah McElheny’s chandelier of sparkly cut-crystal balls and brass rods, which supposedly represents the mapping of a small section of the universe. Each piece of glass represents either a star, a quasar or a galaxy; the length of the rods marks their distance from us. Peter Dreher, Tag um Tag guter Tag Nr. 1527 (Day), 2000, oil on linen, 9 7/8 x 7 7/8"
Kamandy’s six-minute video loop of a suburban LA landscape, projected down onto a pedestal so that we see it from above as we would through an airplane window, everything but the ubiquitous backyard pools has been darkened almost to the point of disappearing: houses, cars, vegetation. In contrast, the pools, like an unstrung necklace of oddly-shaped bluish gems, remain bright, the stark shadows of buildings and trees falling across them, perverse stars in a dark sky– a reversal much like Lisa Blatt’s reflected Milky Way. 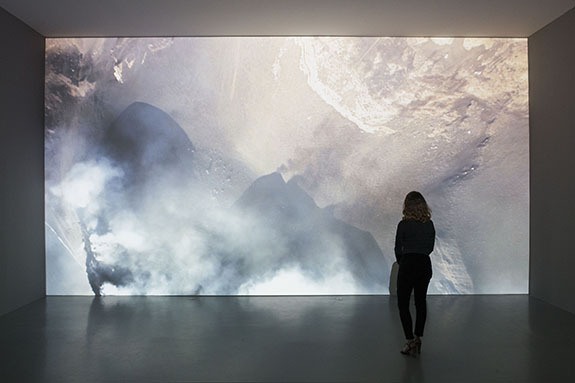 The ocean plays a role in Laurent Grasso’s Soleil Noir, a 16mm film panning over the empty streets of Pompeii, framed between the smoky exhalations of the volcano above and the relentless waves on the rocky coast below. Time telescopes elegantly between the eruption that buried these buildings, their centuries-later rediscovery and exhumation, and the implication that only an instant has passed, in the larger scheme of things. Soft strains of the music for this film—a haunting, wandering composition, suggesting a harmonium —can be heard throughout the exhibition, despite the fact that some other video works have their own accompaniment (which can be heard on provided headphones). Clearly, this “soundscaping” was a deliberate choice on the part of the curators, as part of setting the tone of wonder and mystery for the show as a whole. It both helps and hinders, in that some works benefit from this kind of manipulative experience, while others (including some of the more traditional media offerings) seem slightly overwhelmed. 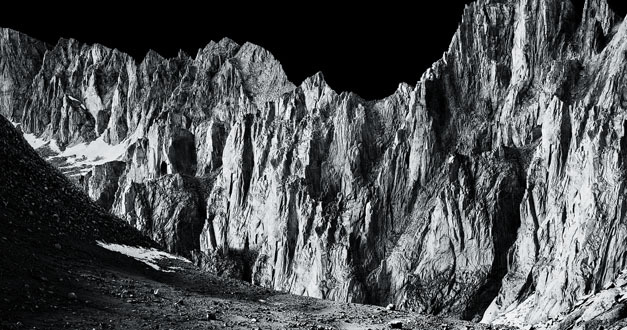 Among the latter are Moira Dryer’s mystical painting of blurred bars and Christopher Woodcock’s truly sublime black and white C-prints of stark, rock-covered mountains, photographed at night with only moonlight as illumination. But A Garden of Parallel Paths, Daniel Crook’s brilliant tour de force 16-minute video of alleyways compressed together into a maze of light and space, holds its own against any extraneous sound, perhaps because its constant movement invokes the rapid shift of images to which we have become accustomed via music videos. In the end, one of the simplest works in the show—in terms of medium and plan of execution– remains one of the most powerful. 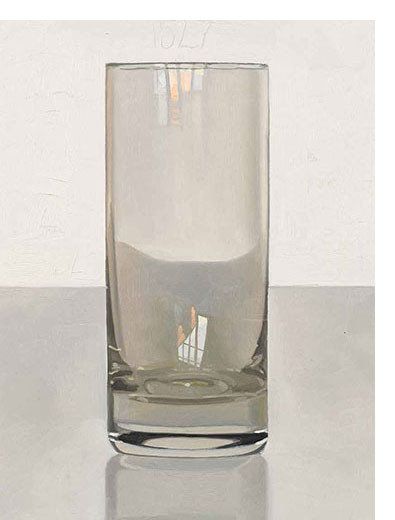 A grid of 80 small paintings, each picturing a single water glass, was selected from the more than 5,000 canvases that the artist, Peter Dreher, has painted to date. Each day or night, since 1972, Dreher has painted the same subject, numbering the pictures sequentially (you can see the number scratched into the wet paint if you look closely). Seen as a group, these paintings seem the same, and yet, on examination, it is clear that they are each distinct, created with scrupulous attention to detail. Different minuscule images are reflected in the glass’s curved surface, recalling reflections in other paintings such as Velazquez’ Las Meninas, or Jan Van Eyck’s The Arnolfini Portrait. Somehow, by drawing our attention to the smallest of details, to a single moment, in a quiet room, Dreher succeeds in capturing the immensity of time and space by marking it, thousands of times. His project is a reminder that each day, like each star in the sky, is different and the same, all at once. 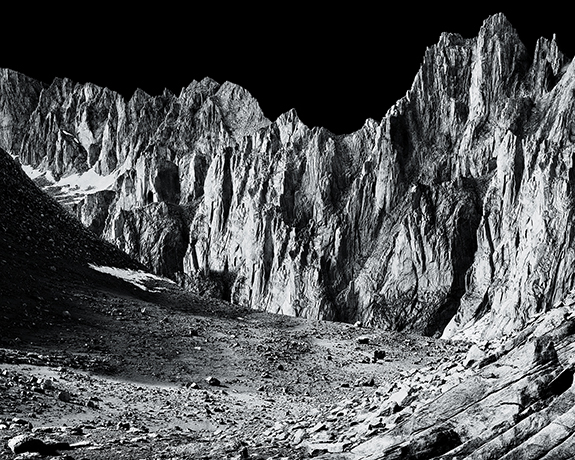 “Night Begins the Day: Rethinking Space, Time and Beauty” @ the Contemporary Jewish Museum through September 20, 2015. Maria Porges is an artist and writer who lives and works in Oakland. For over two decades, her critical writing has appeared in many publications, including Artforum, Art in America, Sculpture, American Craft, Glass, the New York Times Book Review and many other publications. The author of more than 85 exhibition catalog essays, she presently serves as an associate professor at California College of the Arts.